The Yoyo and the Piggy Banks is now a theatrical production! The Yoyo and the Piggy Bank has become a theatrical production! Learn to Earn as Anna saves her coins to buy a yoyo! WHEN: Saturday, March 18th at 10am, also running on Sunday, March 19th, and Saturday and Sunday March 25th & 26th at 10am. WHERE: Seacoast Repertory Theatre, Bow Street, Portsmouth, NH. 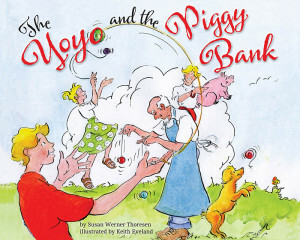 PAPA Workshop: The Yoyo and the Piggy Bank – Anna’s pal Jackson dazzles her with his bright-green yoyo, inspiring Anna to buy her own. But how? Anna’s mother encourages her to earn the money herself, providing Anna with an heirloom piggy bank for saving (and rattling!) her coins. Neighbors offer paying chores and teach Anna some wicked tricks for the sparkly purple yoyo she wants from Mr. Jones’s store. The colorful illustrations capture the joy Anna feels earning her coins, learning about money, and shaking her humongous piggy bank as she nears her goal. Join Anna and friends on her journey in this original musical by Miles Burns, based on the book written by local author, Susan Werner Thoresen. or call the SRT Box Office: 603-433-4472.